Staying on top of maintenance issues, keeping everyone informed on their progress and managing you as tenants, landlords and vendors. Which is why we have teamed up with PropertyFile, allowing us to offer a unique, streamlined service to you. As a landlord, managing your account has never been easier. Track payments, statements and invoices. Follow maintenance job progress. Find out key tenancy related information on your properties. 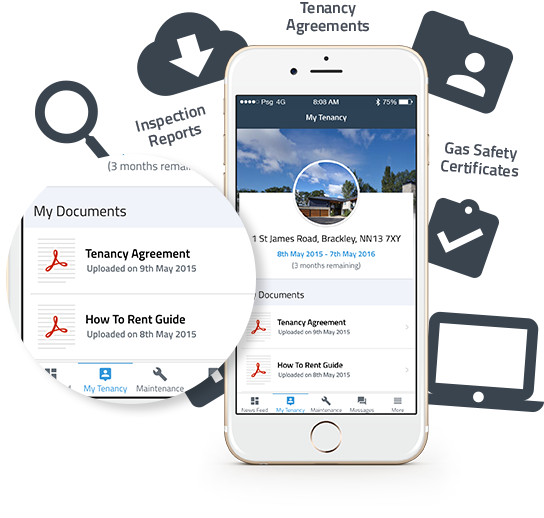 It fulfills your responsibility as a landlord and tracks your progress throughout the tenancies. Keep up to date and on track all from your phone! To our tenants, MyPropertyFile keeps you informed and up to date. It is our responsibility to keep you safe so if there is something wrong with your property, this easy to use reporting tool helps you report the issue to us and track its progress. You are able to stay informed with important updates, like inspections and safety updates so that you can be secure in the knowledge that your home is perfectly safe. Whenever you report an issue through MyPropertyFile, it comes straight to our Lettings and Maintenance team. Enjoy Stress-Free living throughout your tenancy! Friendly, helpful and professional. I have been renting a property through Alexanders as a student at Aberystwyth University for 12 months now, and have just renewed for another 12 months. Any problems within the property have been fixed without delay and whenever we have needed to visit the office it is always a good experience. Highly recommend for anyone wishing to rent a property as a student in Aberystwyth.